Biologist Kara Donohue, holding a golden eagle, calls SCE's avian protection program "a win-win for the birds and the company." Much like the red-tailed hawk rescued in Fontana, this one being checked for injuries by SCE biologist Kara Donohue was not good at flying yet. Donohue eventually set it in some vegetation to get it off the ground. A Fontana animal services officer is overwhelmed after getting more than she bargained for in the unique process. In her 10 years working in animal services, Jamie Simmons has rescued numerous raptors. But what she has rarely done is return any of them to their nest. 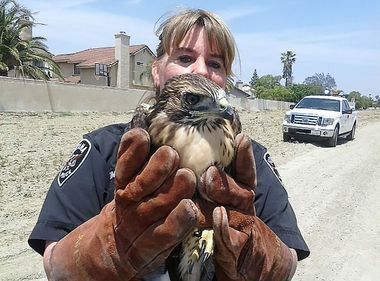 Simmons, the supervising animal services officer for the Fontana Police Department, got that chance last week with a young red-tailed hawk and couldn’t be more pleased. Simmons’ reference is to the assistance she received from Southern California Edison senior biologist Kara Donohue, Safety and Environmental specialist Wayne Williams, Mike Ward, a senior transmission patrolman, and John Egan, a lineman, in safely returning a fallen hawk probably flying for the first time from its nest 60 feet up on a transmission tower near the Southridge community. She was unsure what would happen before she called SCE, but she was surprised and ecstatic about what happened afterward. In fact, a team of 16 SCE biologists, including Donohue, does its part to protect the biological resources (plant and wildlife) in the utility’s service territory while simultaneously maintaining and improving system reliability. 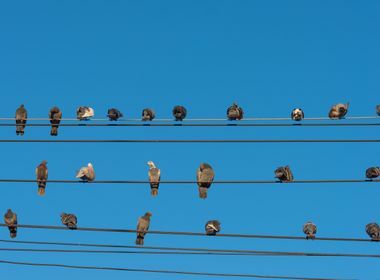 “It's a win-win for the birds and the company,” said Donohue, of the avian protection program that was created in 1988 to prevent bird electrocutions and power outages caused by birds. It certainly was last week in Fontana, where Donohue, via phone, began by asking Williams questions about the situation, including requesting photos to determine the age and species of the bird, whether the nest was intact and accessible and whether adult birds were in the area and seemed to be aware of the young hawk. As for nests in locations where they could cause an outage or worse, they are removed as long as they’re not currently being used by the birds. But you can probably guess Donohue’s favorite part of her job. “Probably the days when I have a situation with a happy ending like [Fontana],” said Donohue, who says she deals most with common ravens, American crows and red-tailed hawks, but also many songbird species nesting in SCE facilities. Donohue won’t get any argument from Simmons. 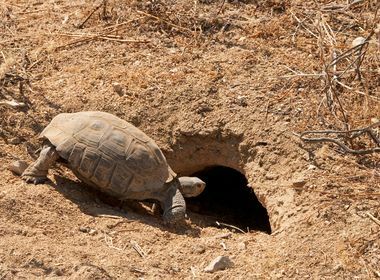 “I had no idea of the care and attention SCE provides to the environment and wildlife,” said Simmons. “Your raptor nest program overwhelmed me.